Aloe Vera has healing and antibacterial properties, which can heal the acne, pimples and also reduce the acne scars naturally. It also prevents and repair the skin breakouts caused by acne and pimples. Aloe Vera not only soothes itchy and swollen skin but also helps in rejuvenating damaged tissues enhancing the healing process. It is recommended to use fresh aloe gel directly extracted from aloe plant. If aloe plant in not available, then you can use readymade aloe gel. It lightens and repairs the damaged skin. It also contains essential anti-oxidants and moisturizing properties, which reduces acne scars and maintain your skin well moisturized. 1. Extract the fresh aloe gel from its leaf (1 tablespoon) and apply it directly over your scars. Leave it on for 30 minutes and then wash it off with normal water. Repeat this daily for several weeks to lighten up the acne scars and other dark spots. 2. You can apply aloe Vera gel twice a day for faster improvement, but add half teaspoon of rose water in it before applying. This will reduce acne scars and also tightens your skin and gives glowing touch to the skin in few days. 1. Mix 1 teaspoon of olive oil with 1 tablespoon of fresh lemon juice or tomato juice/pulp, mix the well and apply on the skin for 30 minutes. Rinse it off with lukewarm water. Follow this daily or 4-5 times a week to reduce the acne scars and dark skin areas. 2. Take 1 teaspoon of olive oil and gently massage the skin for 5-10 minutes in upward and circular direction. Concentrate more on the acne scars. Leave the oil on the face for 15-20 minutes, then take hot water steam for 5-10 minutes and wash your face with normal water. Do this 4-5 times a week. Or soak small towel in the hot water, squeeze it and place on your face to get steam and after 10 minutes wipe away the oil gently with the towel. 1. 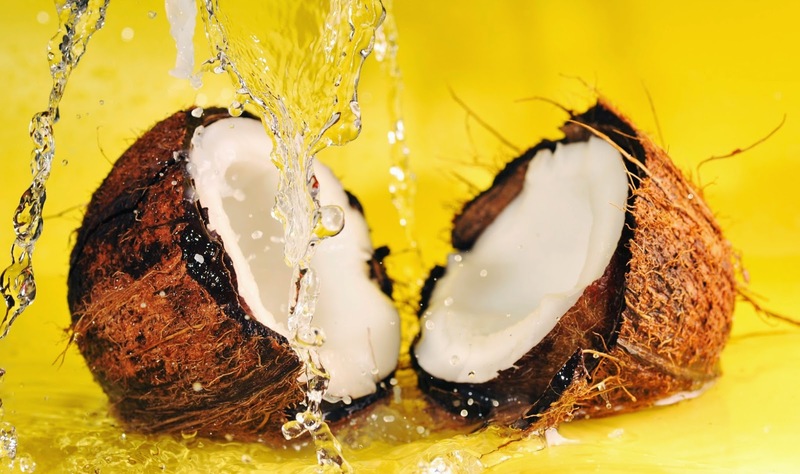 Add 1 tablespoon of gram flour (besan) in 3 tablespoon of tender coconut water and 1 teaspoon of honey, mix them well to form smooth paste. Apply this paste over the skin for 30 minutes and rinse off with normal water. Follow this once or twice a day for several weeks. 2. Mix 3-4 tablespoon of fresh tender coconut water with 1-2 tablespoon of fuller’s earth (multani mitti) and pinch of turmeric. Make smooth paste and apply on the dark skin. Leave it on for 30 minutes and wash off with normal water. Repeat this once a day regularly to lighten up the acne scars naturally. 3. Mix 1 tablespoon of sandalwood powder with 3 tablespoon of coconut water, mix well and apply the smooth paste on the affected areas for 30 minutes. Follow this remedy every day. 1. Mix 1 teaspoon of baking soda with 1 teaspoon of rose water or coconut water, mix it to make smooth, thick paste of it. 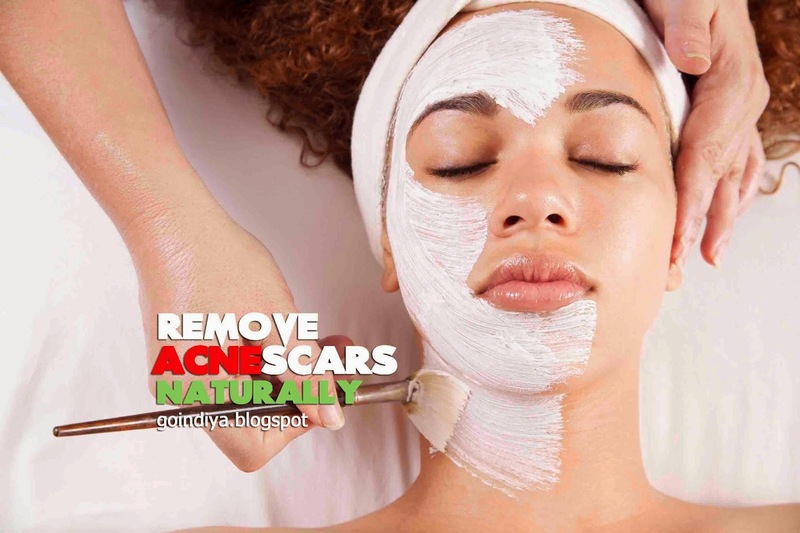 Apply the paste on scars and dark spots for 10-15 minutes and wash it off with lukewarm water. Do this every day or 4-5 times a week to reduce acne scars naturally. Raw potato is also very effective in removal of acne scars and gives you spotless glowing skin. Raw potato contains enzymes which eliminates the acne, pimple scars and bleach your skin. 1. Take two slices of raw potato and rub the gently on your skin in circular and upward direction, massage for 5-10 minutes or the slices has gone dry. When slices become dry, take another slice and continue this for 15-20 minutes. Now leave it on for more 10-15 minutes for absorption of potato juice by your skin. Rinse off with normal water and apply 1 teaspoon of honey for 10-15 minutes as natural moisturizer. Follow this remedy once a day for 2 weeks to lighten the acne scars. This remedy is also very effective for dark spots, under eye dark circles and other marks on the skin. 2. Grate one small raw potato and grind it in grinder, squeeze juice from it. Take 2 tablespoon of the fresh potato juice and add 1 tablespoon of fresh lemon juice to it. Apply the mixture over the face, leave it on for 30 minutes and wash off with normal water. Repeat this every day. 3. Mix 3 tablespoon of fresh raw potato juice with 1 tablespoon of Fuller’s earth (multani mitti) and pinch of turmeric. Mix them well to make smooth paste. Apply this paste for 30 minutes on the skin and rinse it off with normal water. Follow this 4-5 days a week. 4. Take 7-8 fresh mint leaves and crush them to get juice of it. Mix this mint leaves juice with 1 tablespoon of fresh raw potato juice and 1 teaspoon of honey. Apply this mixture over the face for 30 minutes and wash off with normal water. Do this every day to lighten your acne scars quickly.